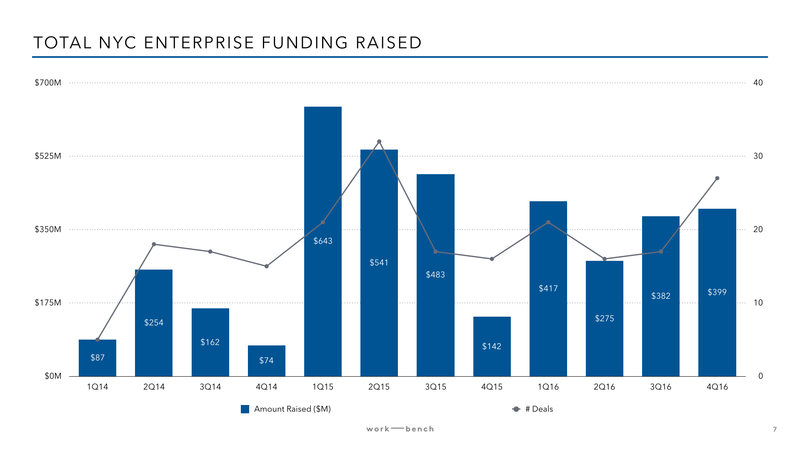 Using data from the Enterprise Startups Funding Database - where every week we track and record all publicly announced enterprise technology funding rounds - we took a look back at 2016 to see how it stacked up against 2015 and 2014. 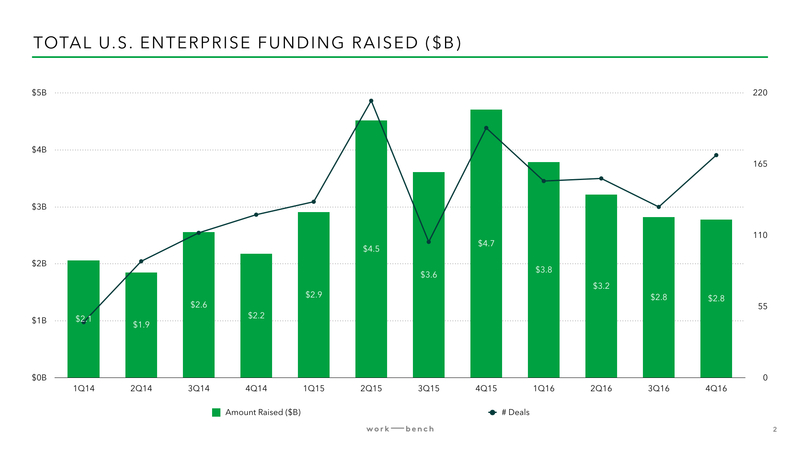 Compared to 2015, enterprise funding decreased by 20% in 2016, with $12.6B deployed in the year. However, deal count only dipped 6% to 611 financing events in 2016 vs 648 in the prior year. Later Stage financing bore the brunt of the decreased capital deployment, with the share of Series D (and later) rounds across the country falling to 9.2% of total deal volume compared to 13.3% in 2015. New York is still solidly in command of second place for enterprise software. In total since January 2014, New York has seen $3.9B flow into various enterprise startups over a total of 222 financings. Although 2016 saw a drought of IPOs, it was a stellar year for enterprise M&A with over $65B in acquisitions. See below a full breakdown of our research highlighting the key activity underpinning this movement, and if you’d like to get in touch, please feel free to shoot us an email or reach out via Twitter to @Work_Bench. After a Q4 high in 2015 with over $4.7B deployed in the startup ecosystem, 2016 kicked off with consecutive quarters of decreased funding activity. As we crunched data for the second half of 2016, while the dropoff continued, funding appeared to stabilize in the last quarter of 2016 with a decrease of 1.5% quarter of quarter (compared to Q3 and Q2 experienced 13.2% and 14.18% decreases q/q, respectively). 2016 ended with $12.6B funding raised for enterprise startups, which despite being a 19.7% decrease y/y compared to 2015’s $15.8B raised, still marks a 46% improvement when compared to 2014’s total of $8.6B. An interesting data point is related to overall deal count. 2016 deal volume of 611 discrete financing events almost matched 2015’s 648 total despite the ~$3B differential in total financing raised. When evaluating just 2H16 vs 2H15, the back half of 2016 actually beats out the prior year in deal count with 304 deals vs 298 deals. Given that 2H15 funding represented $8.3B in financing activity vs 2H16’s $5.6B, this implies that the deals raised in 2H16 were much smaller in size and earlier in stage. On the basis of deal count, Series A financings continued to represent the largest share in 2016 at 31.4%, a higher share than last year’s 27.8% of all financings. This was followed by Series B at 23.4% and disclosed seed rounds at 13.9%. While Series A rounds led the way in 2015, both seed and Series B activity decreased slightly y/y at the expense of the Series A rise and a slight uptick in Series C rounds. Series D & Up financings only represented 9.2% of total deal volume compared to 13.3% in 2015 and 14.0% in 2014. Between numerous sources of late stage capital exiting the market (after the unicorn frenzy died down) paired with valuations remaining too high for many for many of these later stage companies, 2017 will be the moment of truth as these companies either earn their horns and raise additional capital at favorable terms after cleaning up their metrics in 2016 or be forced to raise at harsh terms which penalize employees and earlier investors. For folks currently employed at unicorn companies or considering joining them, Scott Belsky cautioned in a recent blog post that one of his “sad predictions for 2017 is a bunch of big headline-worthy acquisitions and IPOs that leave a lot of hard working employees at these companies in a weird spot. They’ll be congratulated by everyone they know for their extraordinary success while scratching their heads wondering why they barely benefited.” Be sure to read the post and educate yourself. 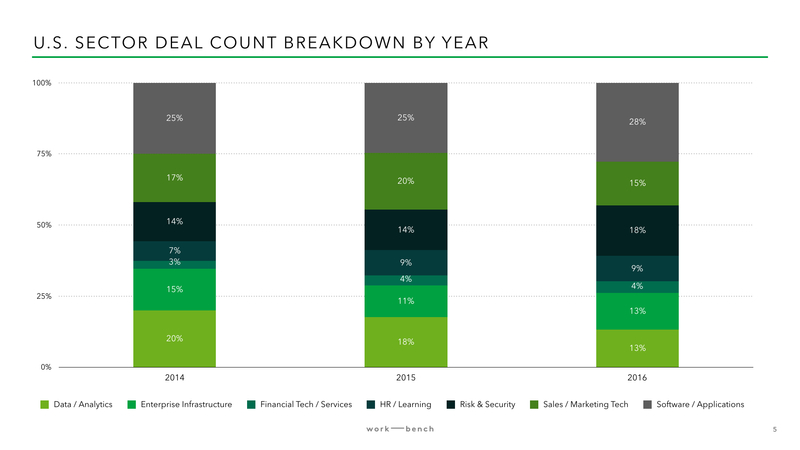 When we look at the annual sector breakdown to get a sense of trends, we see that Risk & Security has made great strides to leapfrog Sales / Marketing Tech for the number two spot by deal count. Risk & Security increased from 92 deals in 2015 to 109 in 2016, whereas Sales / Marketing Tech decreased from 129 deals in 2015 to 94 in 2016. The other notable drop was Data / Analytics financings of 114 in 2015 to 81 in 2016. 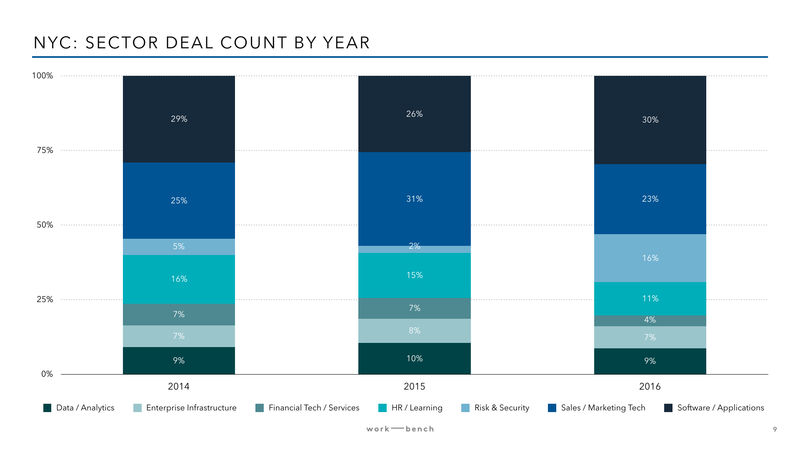 Meanwhile, Enterprise Infrastructure increased deal activity from 72 in 2015 to 79 in 2016, and it’s now right on Data / Analytics companies' toes for the fourth top spot by deal volume. As we look ahead to 2017, we wonder how incumbent cloud vendors like Amazon, Google, and Microsoft will impact investment in Enterprise Infrastructure, and how CISOs' limited budgets and bandwidth to work with startups will impact Risk & Security investments. New York continued building on its position as the clear #2 after California with 81 deals done in 2016. When you compare it to 2015 it was only a 5.8% decrease y/y, compared to Massachusetts which experienced a 26.2% decrease in the number of financings y/y. Washington state stayed flat with 19 each in 2015 and 2016, and Texas dropped to 6 in 2016 from 9 in the prior year. It is no surprise that California remains in #1 but did experience a 15.7% decrease in y/y enterprise activity with 257 deals in 2016 vs 305 in 2015. Since 2014 they’ve had 746 financings though, a clear leader though at 3.4x New York’s deal volume. New York’s relative insulation from the broader investment decreases faced by others demonstrates the positive momentum we have going on in our ecosystem. Since 2014, New York has had 222 financings compared to 95 for Massachusetts, 49 for Washington state, 28 for Texas. Counter to the broader US trend in the back half of 2016, New York City experienced a 25% increase in 2H16 funding ($781M) compared to 2H15 ($625M), in addition to increasing deal volume from 33 to 44 financing rounds. For the full year 2016, New York City totalled $1.5B in capital raised over 81 deals, an 18% drop from 2015 in dollars raised and a 5.8% decrease in deal volume. Compared to 2014 dollars raised ($577M) and deals done (55), the momentum and maturing of our ecosystem really begins to shine in 2016. In total since January 2014, New York City has seen $3.9B flow into various enterprise startups over a total of 222 financings. 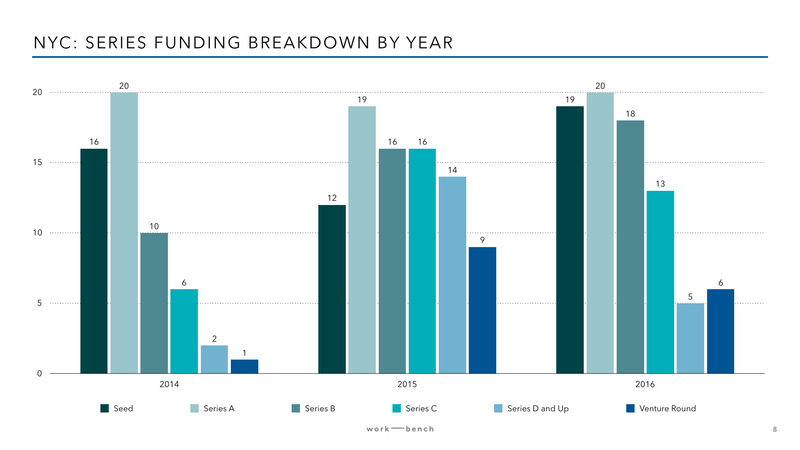 Despite tough macro conditions, funding for seed, Series A, and Series B rounds in New York City in 2016 all topped 2014 and even 2015 levels. 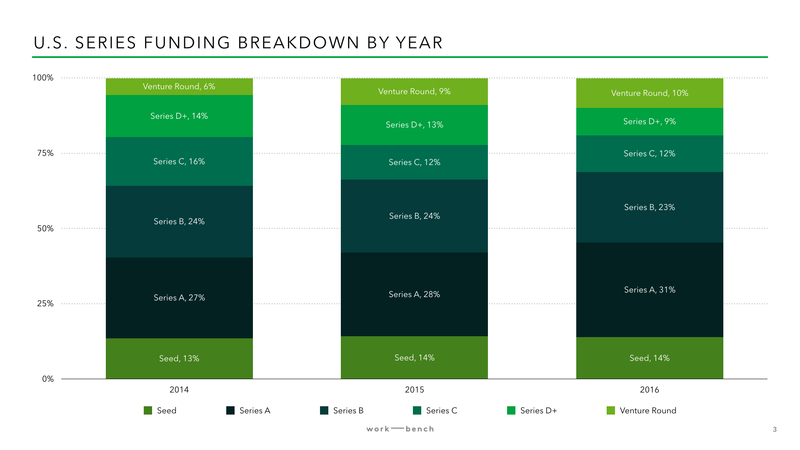 Seed and Series A raises represented 48% of all financing activity on the year. This all points to strong momentum that New York City's ecosystem has in its favor. While Series C rounds raised in 2016 (13) dipped below 2015 levels (16), the pullback of note was in 2016 Series D and Up rounds raised (5) versus 2015 (14). As we look ahead to 2017, in order for New York City to silence its critics, these late stage companies will need to either exit soon or find ways to raise additional capital to fuel growth. Software / Applications leads the way in New York City with 29.6% of 2016 deal volume, and Sales / Marketing Tech has managed to still hang on to the #2 spot despite decreasing activity from 27 in 2015 to 19 in 2016. 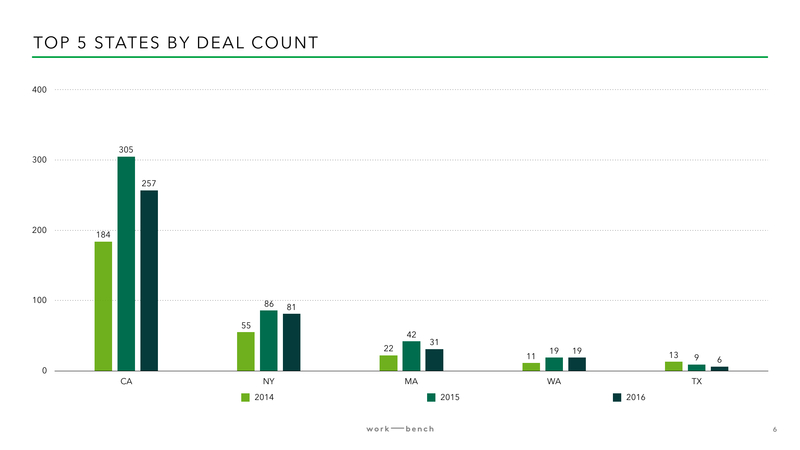 While Risk & Security deal volume has increased across the country, it is especially pronounced in New York City where 2016 ended with 13 deals compared to 2 in 2015 and 3 in 2014. This placed the sector in a solid 3rd place by deal count in 2016, ahead of HR / Learning (9), Data / Analytics (7), and Enterprise Infrastructure (6). When we look at the sector breakdown by dollars raised, we get a sense of emerging vs. mature sectors. While Risk & Security had robust deal activity (16.1% of total deal count), this represented only 9.8% of total dollars raised, indicating the early (but growing) nature of New York City's security sector. Of the 13 deals in 2016, 4 were seed, 5 were Series A, and the remaining 4 were later. 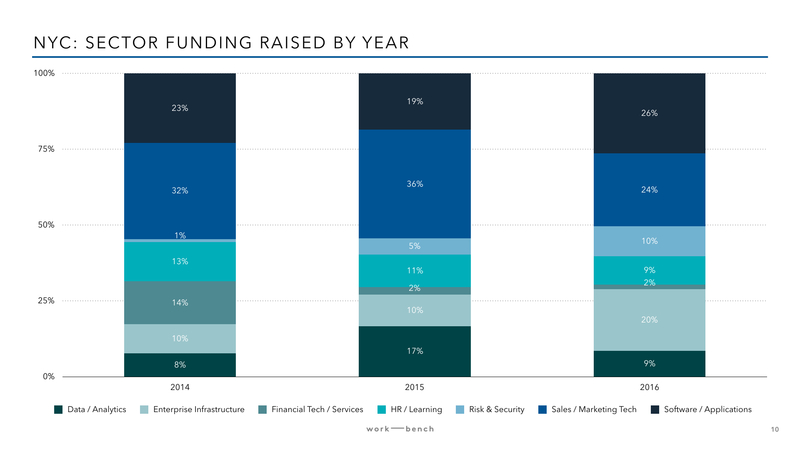 Meanwhile, even though Enterprise Infrastructure was only 7.4% of deal volume in 2016, it represented 20.3% of the total 2016 dollars raised due to the late stage nature of the rounds (i.e. LogicWorks’ $135M round in December, Datadog’s $95M round in January, and the $20M rounds by GigaSpaces, Cockroach Labs, and NS1). As New York City continues to mature, median financing rounds are increasing in size too. Median seed rounds ended 2016 at $2.5M in size, compared to $1.7M in 2015, representing a 49.3% increase y/y. 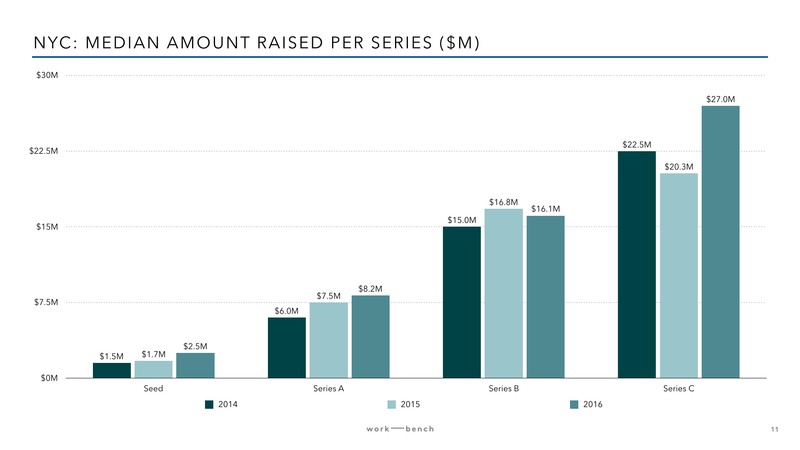 Series A rounds also crept up to $8.2M raised in 2016, a 9.3% y/y increase. Series B rounds have remained somewhat consistent, with $16.1M being the median raise, a 4% decrease y/y, but Series C median raises also jumped dramatically from $20.3 in 2015 to $27.0 in 2016, a 33.3% y/y increase. Although 2016 was a lighter year for IPOs with Nutanix, Coupa, Apptio, Everbridge, Oclaro, Blackline (Canadian), and Talend (French) going public, it was a stellar year for enterprise M&A with over $65B in acquisitions. See below for a break down of enterprise M&A in the first half and second half of 2016. Work-Bench is an enterprise technology VC fund in New York City. We support early go-to-market enterprise startups with community, workspace, and corporate engagement. We'll continue providing updates on our ecosystem, and if you enjoyed this post, make sure to give it a share on Twitter and sign up for the Enterprise Weekly, our weekly digest on all things enterprise with 10K+ subscribers. Methodology: all data was sourced from our Enterprise Startup Funding Database. The Work-Bench Enterprise Funding Report covers only publicly announced deals. We define enterprise software companies as companies selling into large, global Fortune 1000 customers, with a focus on: Data & Analytics, Risk & Security, HR & Learning, Enterprise Infrastructure, and Software & Applications. Contact us at fundings@work-bench.com to let us know of any additional deals that should be included. Jon is a geek who dreams about how innovations in enterprise technology can improve the way business is done. Jon leads Work-Bench's investments in top early stage enterprise tech startups and is the Founder of the NY Enterprise Technology Meetup. Mickey loves all things enterprise, spending his nights reading about sales models and consumerization. He works on building community through Work-Bench's content and media outlets. Copyright © 2016 Work-Bench. All rights reserved. Sign up for the Enterprise Weekly - our weekly digest of all things enterprise - and receive invitations and updates from our community.